Doctor and amateur sculptor Georges Bonnet (Anton Diffring – Circus of Horrors, Fahrenheit 451) has discovered a murderous method of maintaining his youth, once every ten years he murders a young woman and removes her parathyroid glands to replace his own. But after 104 years, he’s run into some problems. His collaborator is now too old to perform the surgical procedure, and a detective is on his case. In desperation Bonnet blackmails another surgeon (Christopher Lee) into performing the procedure by threatening the life of Janine Dubois (Hazel Court), a woman whom both men desire. 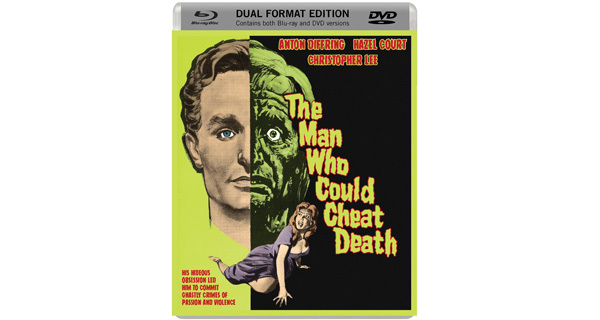 Directed by Terence Fisher who transformed the fate of Hammer Pictures with his vibrant and explicit series of gothic horror films, including The Curse of Frankenstein, Dracula and The Hound of the Baskervilles, and with colourful cinematography by Jack Asher, Eureka Entertainment present 1959’s The Man Who Could Cheat Death for the first time on Blu-ray in a special dual-format edition on 21 September 2015.